Standalone Tower and OpenShift Tower use different installers. Tower (via RabbitMQ) links to OpenShift itself in order to facilitate scaling up and down without requiring the user to manually execute the playbook (to bring up new nodes) or run management commands in the shell (to take nodes offline purposefully). 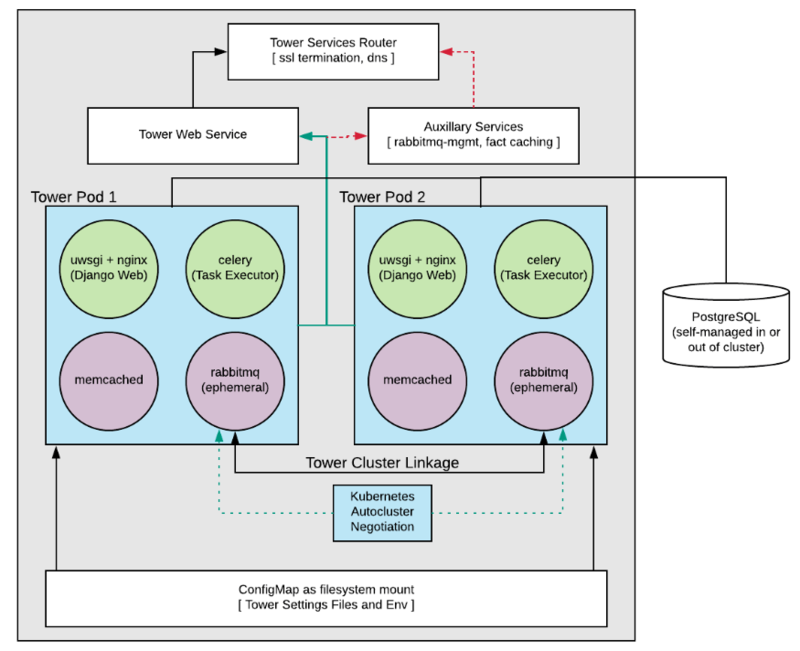 The user can configure the Tower StatefulSet once the system is up to add more or remove extra Tower Pods. Database migrations run as part of the process of bringing up the celery/task executor container within the pod (see diagram) and thus will likely happen after the playbook has completed. The password should be given on the command line as shown when executing the installer. The oc command line client should be installed and available and the client version should match the server version. The secret-key, admin password, and postgresql username and password should be populated in the inventory file prior to running the installer. Tower uses Bubblewrap (from Project Atomic) as a mechanism to give the (relatively) unprivileged awx user the ability to isolate Ansible processes from each other. There are certain privileges that need to be granted to the container that necessitates running the Tower web and task containers in privileged mode. Normally Tower examines the system that it runs on in order to determine what its own capacity is for running Jobs and performing background requests. On OpenShift this works differently since pods and containers will tend to coexist on systems. Pods can also migrate between hosts depending on current conditions (for instance, if the OpenShift cluster is being upgraded or is experiencing an outage). It’s common for Pods and Containers to Request the resources that they need. OpenShift then uses this information to decide Where things run (or even if they can run). Tower will also use this information to configure its own capacity for how many (and the size of) individual jobs can be run. Each Tower pod is made up of 4 containers (see diagram), each container is configured with a conservative default, but taken all together they can be somewhat substantial. These defaults are also configurable but it’s helpful to know what effect that has on the Tower cluster. 1500 is 1500 millicores which translates to roughly 1.5 CPU Cores. Which is to say that, by default, Tower in OpenShift (when configured entirely for cpu-based algorithm) can run at most 6 simultaneous forks. task_mem_request=2 - This is the amount of memory to dedicate (in gigabytes). Which is to say that, by default, Tower can run at most 20 simultaneous forks when configured for mem-based algorithm. For the default resource requests, see roles/kubernetes/defaults/main.yml. The OpenShift instances that you want to run Tower on should at least match that. If the defaults are changed then the system will need to be updated to match the new requirements. If other Pods are running on the OpenShift instance or the systems are too small to meet these requirements then Tower may not be able to run anywhere. Refer to Capacity Algorithm for more detail. PostgreSQL is installed in Openshift using the Tower Installer by providing a pre-created PersistentVolumeClaim and providing it the the Tower install playbook inventory file as pg_pvc_name. If you are installing Tower for demo/evaluation purposes you may set openshift_pg_emptydir=true and OpenShift will create a temporary volume for use by the pod. This volume will be deleted when the pod is stopped so do not use it in production… the data will be removed at some point. configmap will be recreated from values in the inventory file. The inventory file is included in backup tarball. Prior to performing an upgrade, you must backup and restore into the same version before upgrading. To upgrade a Tower deployment in OpenShift, download the most recent installer from http://releases.ansible.com/ansible-tower/setup_openshift. Expect some downtime, just as traditional Tower installations. First, upgrade your traditional Tower setup to Tower 3.3 using the normal upgrade procedure. Edit the inventory file and change pg_username, pg_password, pg_database, and pg_port to point to the upgraded Tower 3.3 database from your traditional Tower setup. Run the OpenShift installer as normal. It is possible to override the base container image to build custom virtual environments (virtualenvs). Overriding the base container is used for customization and custom virtualenv support or for local mirroring. If you want to use custom virtual environments with Tower deployed in OpenShift, you will need to customize the container image used by Tower. RUN sh -c ". /var/lib/awx/venv/ansible2.3/bin/activate ; pip install ansible==2.3.3.0"
If you need to install other python dependencies (such as those for custom modules) you can add additional RUN commands to the docker file that activate the virtual environment and call pip. Once the image is built, make sure that image is in your registry and that the OpenShift cluster and installer have access to it. The image must be tagged with 3.3.0 or pass version variable to installer to override.